Nearly a decade ago, it all seemed so easy. Middleton’s girls volleyball team went to consecutive state tournaments in 2008-’09. And that marked the fourth time since 2001 the Cardinals qualified for state. In the nine years since, though, Middleton hasn’t been back. The Cardinals have remained a high-level program, but a trip to state has eluded them. Middleton is hoping to change all of that in 2018, though. The Cardinals welcome back nine seniors, including first-team all-conference outside hitter Lily Welti, from a team that shared the Big Eight Conference title a year ago. “With nine seniors and the experience level that we have, we definitely are looking at not only winning the Big Eight, but taking that trip to state,” Middleton coach Franco Marcos said. 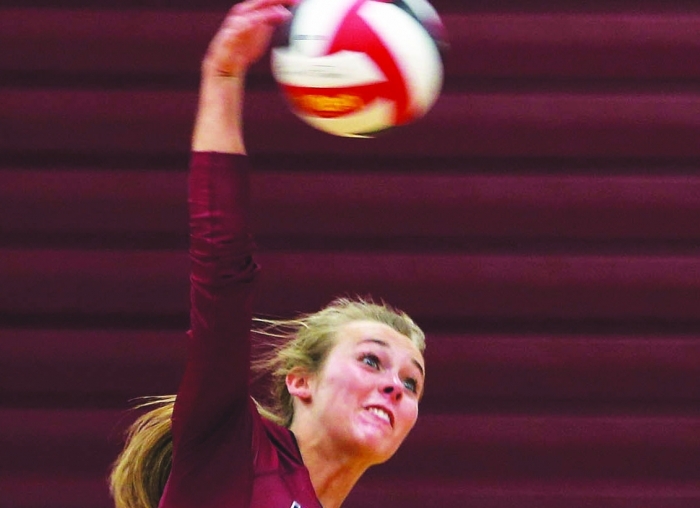 Welti, a St. Louis University recruit and a team captain, led Middleton with 347 kills last season. Welti was also first in digs (326), second in serves received (435) and fourth in aces (43). Senior middle blocker Hannah Flottmeyer was a second-team all-conference selection a year ago. Flottmeyer led the Cardinals in solo blocks (119), total blocks (204) and was first in hitting percentage (.256). Senior libero Olivia Farin received honorable-mention all-conference honors last year. Farin was third on the team in digs (279) and third in serves received (422). Senior outside hitter Keller Frinzi, junior setter/rightside hitter Evie Coleman, senior setter Rachael Roberts, senior middle blocker Taylor Byington, senior defensive specialist Reagan Thomas and senior rightside hitter Lauren Hendricks are Middleton’s other key returnees. The Cardinals’ top newcomers include junior middle blocker Erica Collins, senior outside hitter Torrey Coan and sophomore defensive specialist Jada Cerniglia. Middleton lost a strong senior class anchored by outside hitter Jennifer McGinnis and setter Kayla Underwood. “That group knew what they needed to do and left it on the court,” Marcos said. But this year’s Cardinals could be even better. Middleton is among the frontrunners in the Big Eight once again. And the Cardinals will be among the favorites in their sectional, which includes 2017 state qualifier Waunakee. But so are the Cardinals. Perhaps the drought is about to end.